Coming off that success, I tripled my expectations but unfortunately, not my efforts. I again made three New Year's resolutions for 2010 and kept one of them. The one kept was to do Project 365 this year. I took a photo almost every day and did makeup photos for the days I missed. Does it really matter if I picked out paint swatches one day and then did the photo of me holding them up for selection the next day? My husband is now a little more involved in photography than before. He'll ask me if I've taken my photo today and sometimes suggest something that would make a good shot. He has even picked up the camera a few times himself to capture the day's photo. Many people scrapbook these photos in albums with photo pockets or use the same layout format for each week. I preferred to experiment. I did weekly single page and double page spreads. I did some with two weeks together and a couple of monthly spreads. For the third quarter we had lots of travel and big events so I did those and then 'everything else' layouts to capture the day to day. And for the last few months, I've done layouts more by subject, like day trips, fall photos, and now some Christmas layouts. These are still capturing the day to day stuff. 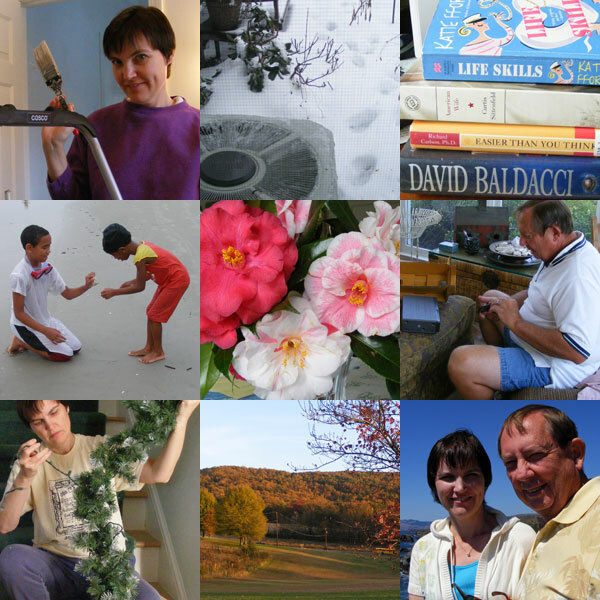 I love having a record of our everyday things - many of these things would never have been photographed otherwise. I so wish I'd done this 10 or 15 years ago. So I'm really glad I did Project 365. Will I do it next year? Yes and no. I'll do more every day photos I'm sure. 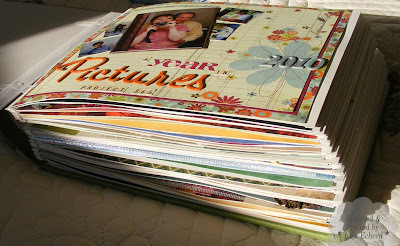 Like creative thinking, it has become a habit and I'll scrapbook more routine stuff than before this project, I'm sure. And all this reminds me that I need to take today's photo and I know exactly what it will be - part of my year end 'got to get this done before the business year closes' list. It's one of those every year things that will someday be a little memory tucked into my scrapbook. Have you decided on any resolutions? Hope you enjoy ringing in the New Year! The tree went out yesterday and all the needles are vacuumed up. Well, not all, I'm sure I'll find stray needles until next July. How do they hide so well? Taking down the tree is a mix of "it's time to get back to normal" and sadness. 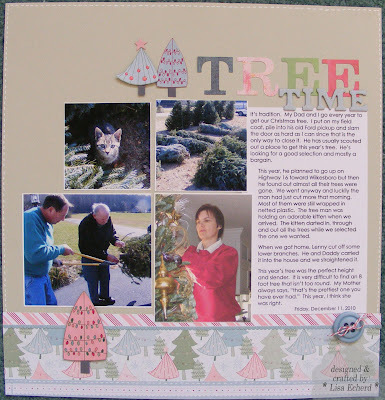 I just finished this layout on getting the tree. 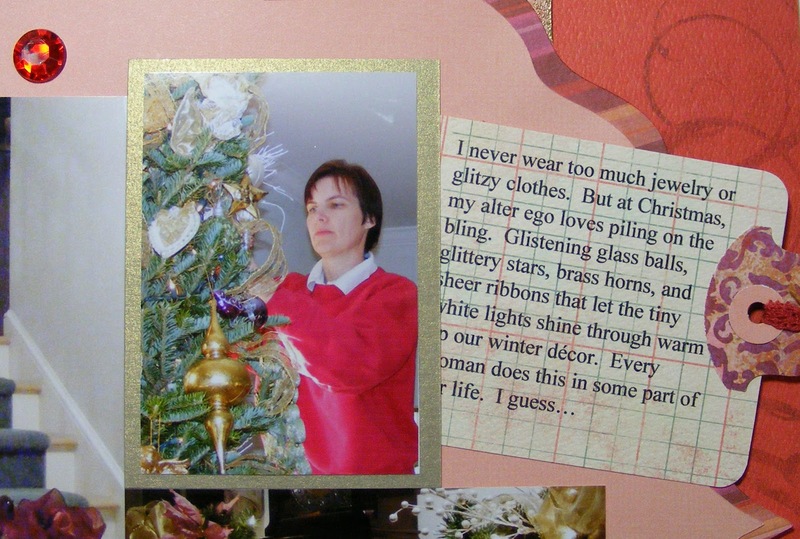 I take photos every year and I think this is the first time it has ever made it to the scrapbook. Tree shopping is special because it is something Daddy and I do together - just us. He loves a bargain (He still talks about the one he got on a roadside stand for $15 one year) and always scouts out potential locations before we go shopping. This year's tree was $25 and truly fresh cut! 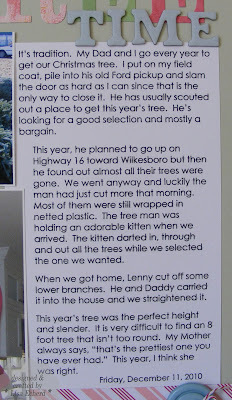 We live only about 40-60 miles from NC's many tree farms but that is a deal even for us. I loved it because it was the perfect size - tall and trim. For this quick layout, I placed the 4 photos with one corner together and built everything out from there. The 'trees' are cut from one of the designer papers and colored in with markers. I was going to stitch this on the machine but it was so close to done, I just did a little faux stitching with a white gel pen rather than go all the way down to the basement for my sewing machine. I have an old home sewing machine I could use for this, but I just don't have anymore room in my scrap space. If you had a tree, is it still up? What about your other decorations? I'm leaving the garlands on the mantle and fireplace up for at least a couple more weeks. It just looks too empty to take it all down at once. 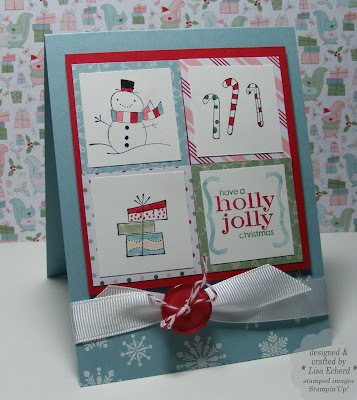 Ingredients: DSP: Candy cane Christmas by Stampin' Up! Button: Baja Breeze by SU! Why are making masculine cards so difficult? Is it just me? Perhaps it is that I have so few stamps that lend themselves to masculine cards. I just love flowers and birds but then my husband loves flowers and likes birds well enough so maybe it is my interpretation of what is masculine. He must like birds, he waded through the snow to feed ours today, bless him. Anyway, the Splitcoaststampers color challenge was to use Night of Navy, Old Olive, Daffodil Delight (I had to sub So Saffron) and a button or brad (I used a grommet). The inspiration was Mary's husband's birthday. Happy Birthday! I did two of these cards and will use them as Any Hero cards in my next OWH box. I thought the yellow ribbon would signify a hope that the heroes who receive them will be home soon. 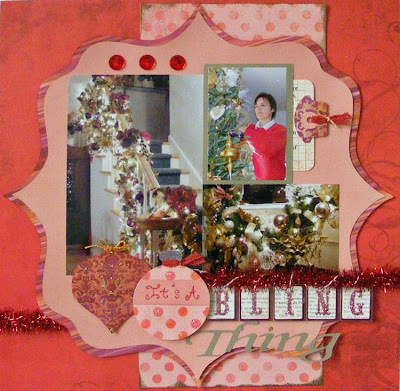 the background is my favorite technique from Jennifer McGuire's Holiday Thinking Inking class at Two Peas. If you haven't taken this, it is wonderful! She used Ranger inks but I used SU! 's inks, even Craft ink worked. You ink up an acrylic block, spray with water and then coat your paper. It takes a couple of coats and some dabbing but it is a lot of fun. The edge is distressed in Soft Suede. Let's get a little more use out of our punches. 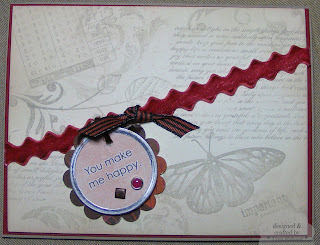 Here's a border made with the tab punch from Stampin' Up! 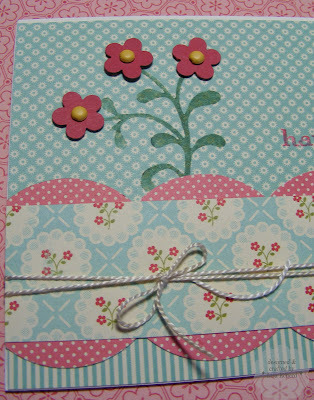 The video shows how the card was made mainly focusing on the border. 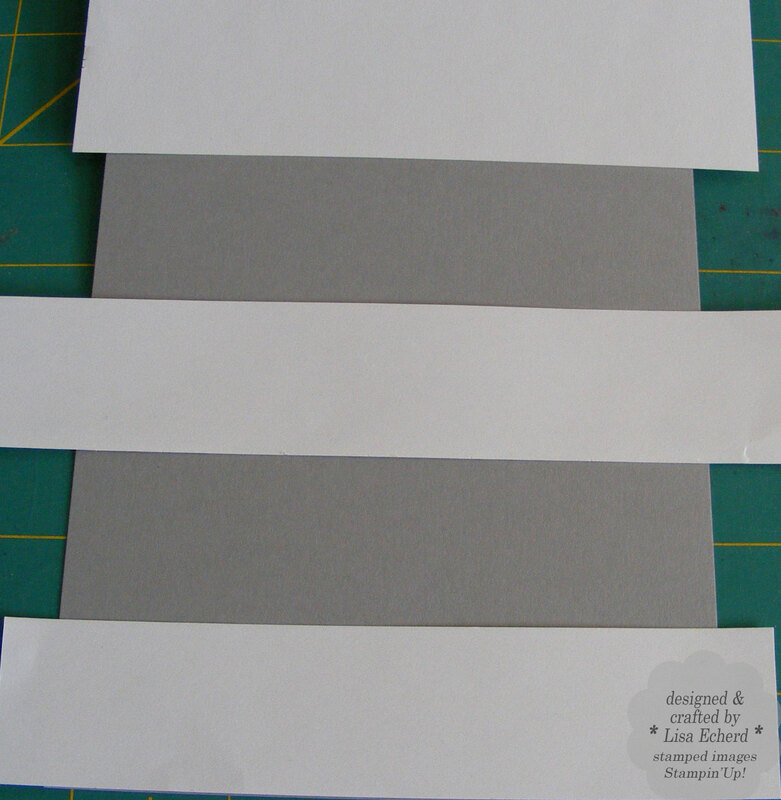 I used all one DSP for the tabs but you could use a variety of papers for alternating scallops. 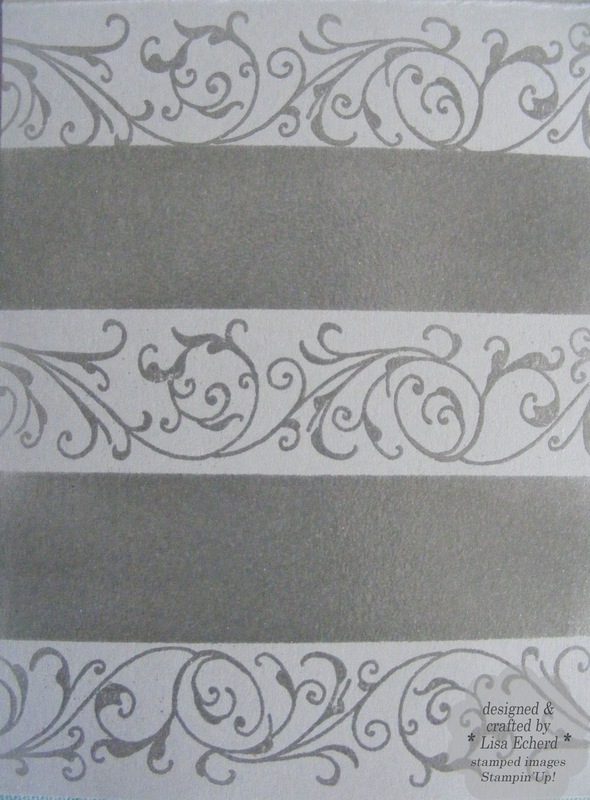 The floral designer paper on top is cut 1 3/8" wide. 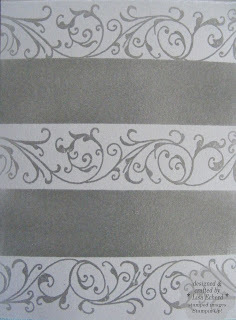 Cardstock: Ruby Red, Naturals white (for card base), Very Vanilla from Stampin' Up! Anyone who walked into my scrap space would get a very mixed message, if they could see through the clutter that is. Is it Christmas or Valentine's Day? 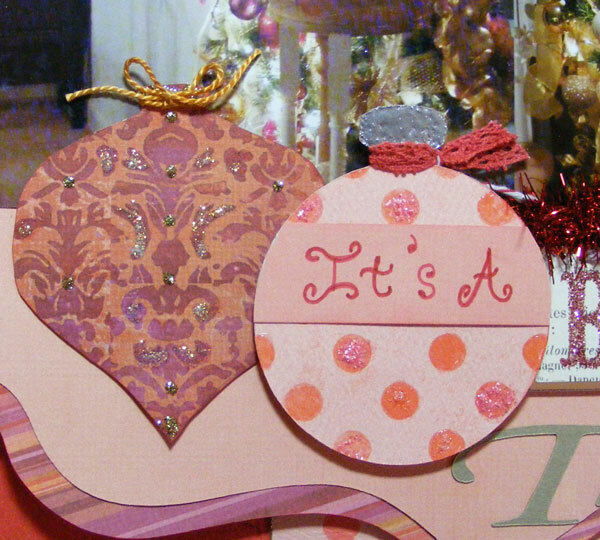 I'm still doing holiday themed layouts and I've made a few Valentine's Day cards for Operation Write Home. The deadline for shipping those is in early January so not much time to pause between holidays. 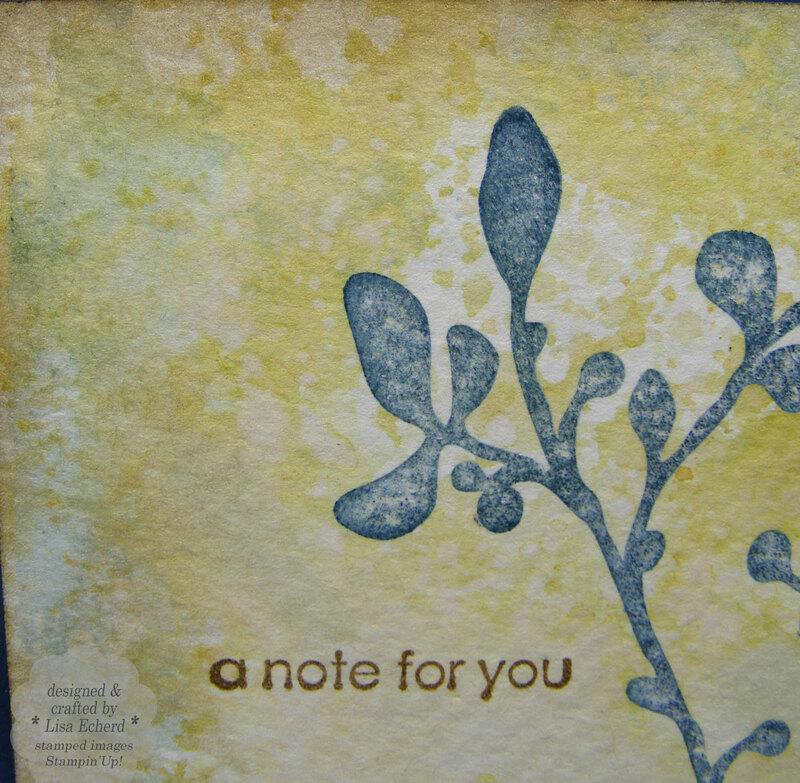 I made this card last week for the card sketch challenge (#312) at Splitcoaststampers. I've been really challenged to hop from Christmas trees and snowmen over to hearts so I decided to do a floral theme. Seemed an easier transition. The main rose is colored with a combo of SU! markers and watercolor crayons. Watercolor crayons always come out lighter so there is even some Ruby Red mixed in with these corals and light pinks. I used my new EK Success edge punch on this one. It just jumped into my hands one day when I was walking through Hobby Lobby and not wanting to be a shoplifter I had to buy it. :-) In addition to the bracket shaped edge it embosses. 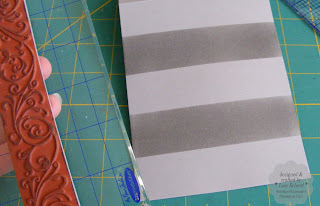 Works great with these heavy Papertrey Ink cardstock. 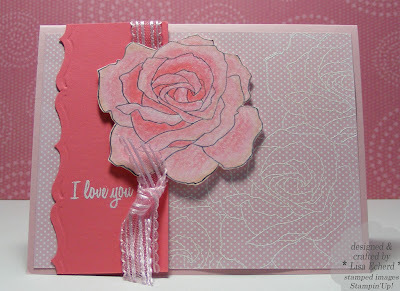 The background roses are embossed after stamping them on some SU! Sweet Pea paper. 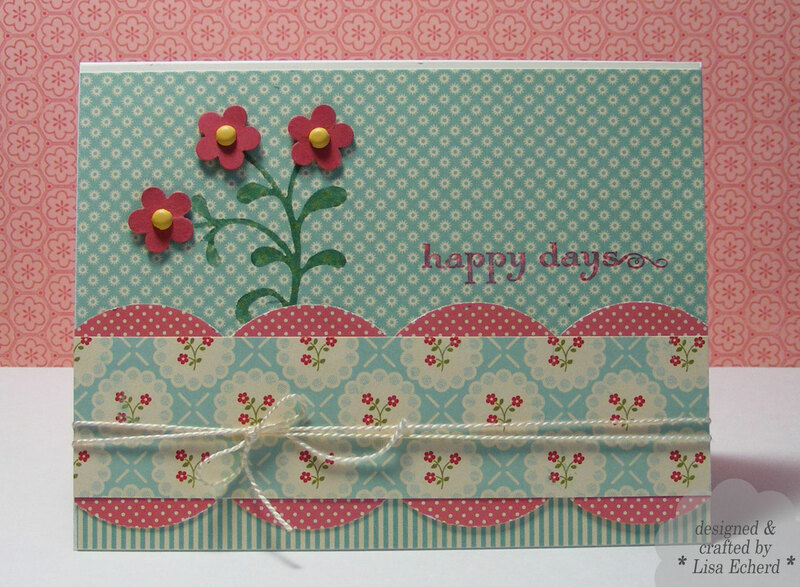 DSP: Sweet Pea from Stampin' Up! Cardstock: Berry Sorbet from PTI; Blushing bride from SU! 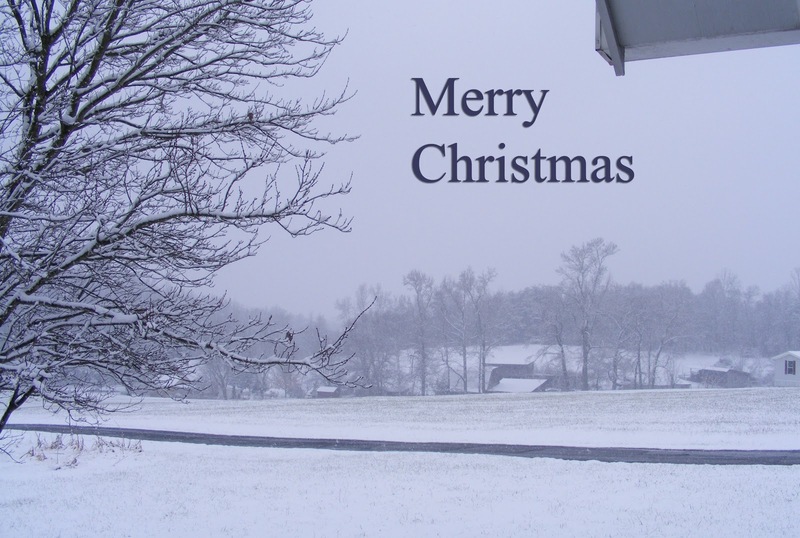 My first white Christmas! 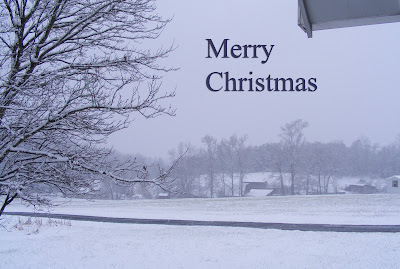 It started snowing before 10 a.m. this morning just after I filled the bird feeders. The birdies sure are happy I got out there because it has been coming down all day. Just gorgeous! I know it really messes with so many travel plans but it is so beautiful. We had our own plans to start a new tradition of going to see Christmas lights on Christmas night and I could tell my Dad was disappointed we wouldn't be able to go. It sounded like he and Mother had been scouting locations. For now, we will just stay comfortably inside and watch it get more and more like a winter postcard. Congratulations to Operation Write Home (www.operationwritehome.org) for winning $25,000 donation from Jo Ann's fabrics! Thanks to all of you who voted for them! These are some cards I'm getting ready to send by the first of the year. Valentine cards are due in early January. 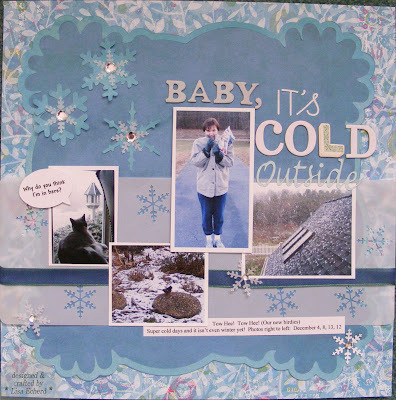 The background was inspired by a new collage stamp from Hero Arts. I made my own collage by stamping a butterfly, some office stuff, flourishes and text in the same ink color on a neutral background. I got a variety of looks. 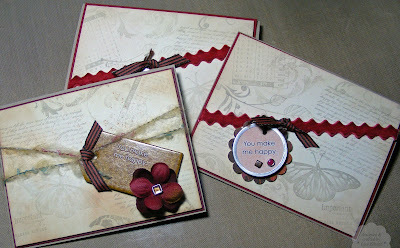 One was used on yesterday's envelope card and the remainder for these 'love' cards. It is a great way to use some of those stamps that might not be getting as much exercise as they once did. Happy day! I think I'm going to be braving the stores with my aunt today after her doctor appointment. A determined lady in an electric wheelchair and her niece struggling to keep up :-) Wish us luck! Ingredients: A variety of stamp set including Text Style from PTI; Flourishes from Paper Studio; Itty Bitty Background, Office Accoutrement, God's Beauty by Stampin' Up! Other embellishments: Ribbon from the Enchanted Cottage in Winston-Salem, Basic grey paper and brads, tags and rub-ons from SU! Twenty years ago today, my husband and I had our first date. We saw "Home Alone." I don't know what Macaulay Culken is doing tonight but we are going to celebrate the 20th Anniversary of our first date the closest we can. It is another anniversary today, too. Nineteen years ago today, I gave Lenny our first scrapbook. It was about 15 pages of our first year together. There were no fancy papers. I typed all the journaling on plain white computer paper from a dot matrix printer! There were some photos. I suppose I should scan one and share it on the blog but I'm not that brave. Do you really want to see me with my permed hair? Do I really want to compare that unlined face to the one today? Nah. It's been a wonderful 20 years. Since it was so long until we married, this day was the "anniversary" we celebrated for a long time. I'm giving Lenny a scrapbook today of the last year - mostly. There are still some big events and the month of December incomplete. Still, it is a tradition. Here is his card. 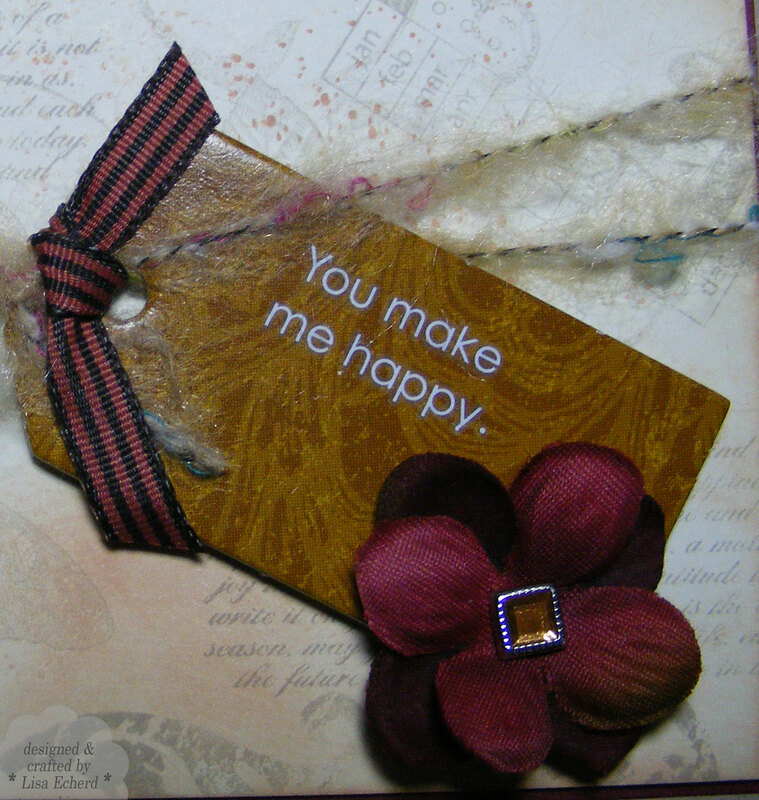 I did an envelope card with all sort so mushy prose inside. I'll just keep that hidden along with those old photos. Thanks for stopping by today. I'll have a new TIP next week. And later in the week, I have a special Christmas layout to share. 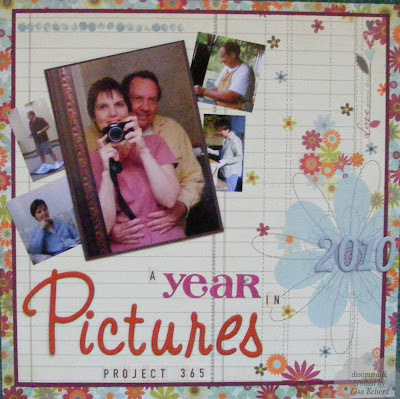 Chipboard: Marquis by American Crafts, "Pictures" is in Wilma by Basic Grey painted with acrylic paint. 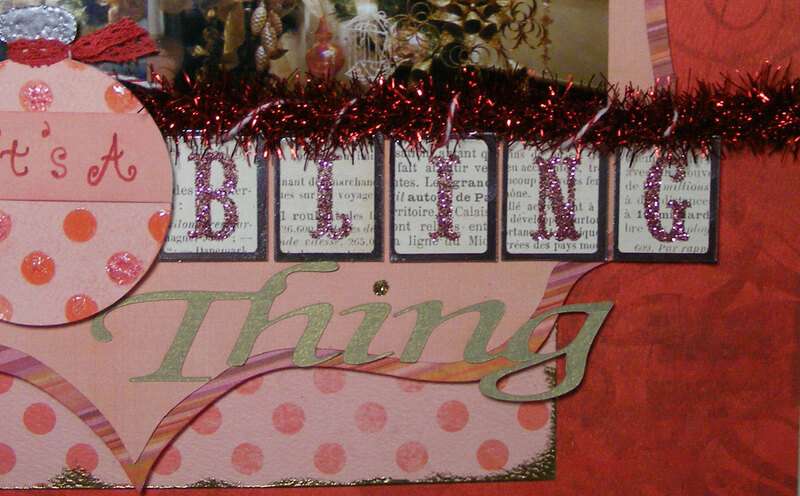 After doing the Scrapbook Annonymous challenge for using rub-ons, I decided to just use up the ones from my package. These were part of Sale-a-Bration 2007 so it was about time, don't you think? I don't use Rub on's very often and haven't found great way of storing them once I've cut up a sheet quite a bit. There always seem to be little pieces that float free and cling to other pieces generally making them all useless. So before that could happen, I took what was left of the white and black sheets and made a couple of cards. I do like applying them. It is very simple yet something sort of magical about pulling away the transfer sheet and seeing the image look so pristine. 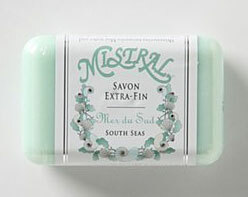 Of course, they are great on lots of surfaces which is why I think I selected these to begin with. 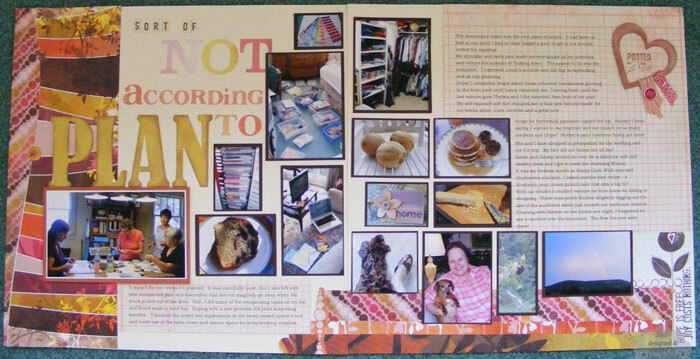 Speaking of Sale-a-bration, I got my 2011 catalog this weekend with my last order. It doesn't start until late January. 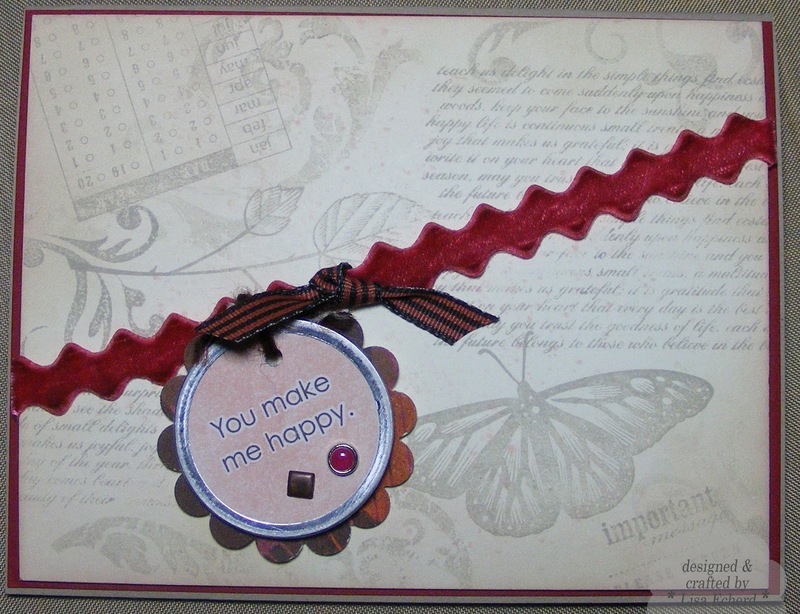 There are several stamp sets, a paper/sticker combo and my own favorite a ribbon/button combo. You can also pick stamps under $14.95 from the main catalog as your SAB option. What I'm most excited about is the mini for Spring. I'm not sure I've ever ordered out of a Spring mini before but I will be this time. Lots of great goodies in this one! Several of the stamps and embellishments relate to sewing so that is definitely for me. Ingredients: Rub-ons Love and Happiness by SU! DSP: Jersey Shore from SU! and Regal Rose, Apricot Appeal and Brocade blue DSP's. Isn't it frustrating when a card just won't seem to come together? That was the way with the TIPsy Tuesday card this week. 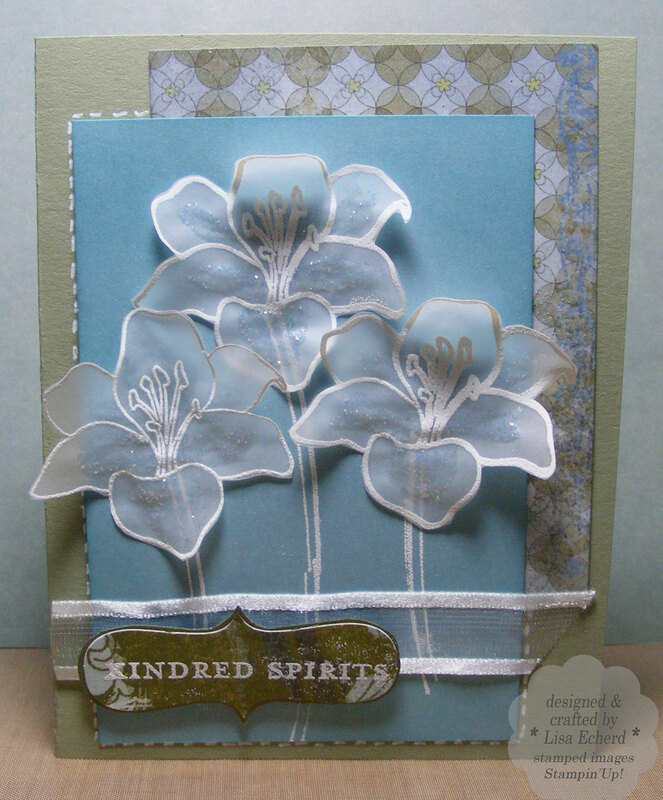 I did some white embossed flowers on vellum and got them all cut out and then did the background I had in mind. It was just too busy with the flowers on it. Then I drug out a half dozen other things before going really simple. 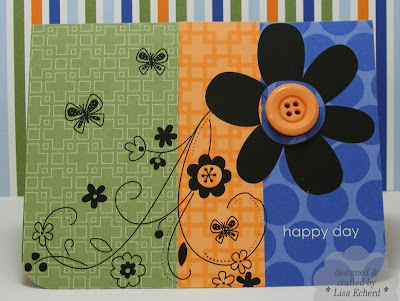 So for today's card, I still had those pretty little flowers laying around minus the glitter we were charged with using in today's Ways to Use It at Splitcoaststampers. My sparkle comes from Diamond Stickles. I put a generous dab close to the center of the flower on each petal and then spread it out with a paint brush. This card also fits the sketch for this week's sketch challenge. I flipped it horizontally because my designer paper had a prettier border on the right side. I wonder how many cards this paper has made! I'm down to just a little scrap. It is from the Periphery collection of Basic Grey and it seems to be one of the few soft colored papers I have. Must make a note to order more light blues and blue grays. Do you have papers you just turn to over and over again? Thanks for visiting today. Hope you stay warm wherever you are. 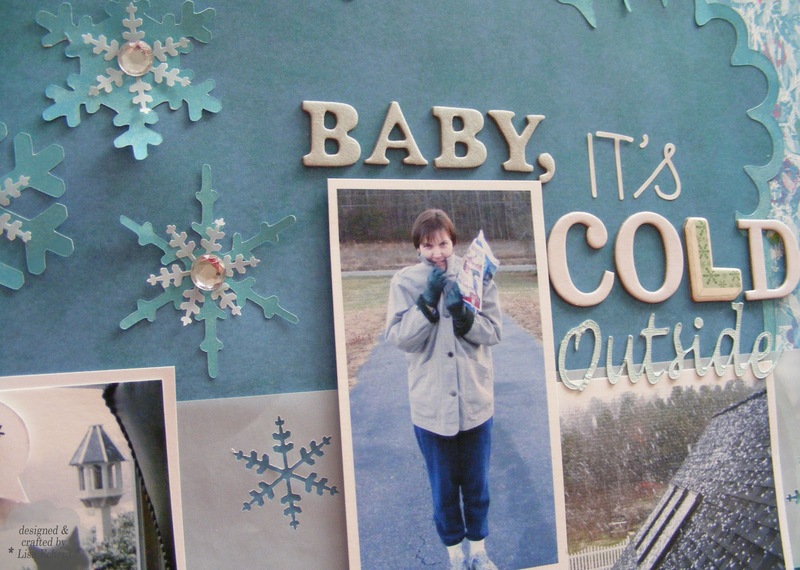 With making and sending holiday cards and trying to get a scrapbook completed, I haven't had as much time for general card making. This one is for the color challenge at Splitcoaststampers. The colors this week are Going or Basic Grey, Marina Mist and Concord Crush. I had to sub some ink colors since I don't have these new ones but I got pretty close. I love Going Gray and was so sorry to see it get discontinued. Cut strips of paper in even widths. Mine are 1 1/8" which is the width of the small wheel I planned to use in between my darker solid stripes. 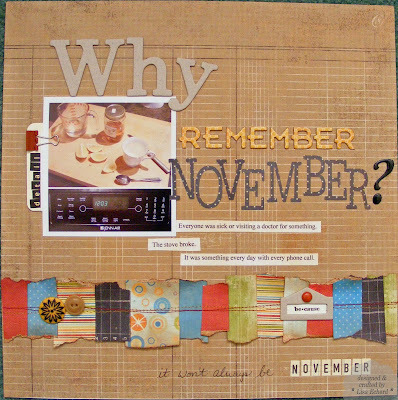 Adhere strips with removable adhesive at even intervals - in my case 1 1/8". Ink the open spaces with Versamark. I pressed my pad directly onto the cardstock repeatedly to get a good coverage. Coat with clear embossing powder. REMOVE strips to get that adhesive away from the heat. Heat to complete embossing. Stamp in between as desired. I stamped with an unmounted wheel in Versamark and embossed. Here's the result. To finish the card, I tried some Chalk Ink on a piece of chipboard. Boy, did it coat! Like dye ink, it does dry a lighter finish. The flower is from the Pretties Kit at stampinup.com Last I checked, this was still available at a greatly reduced price on their clearance rack. 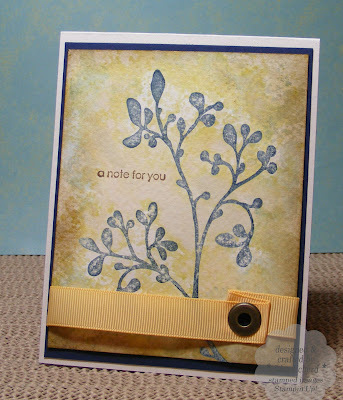 Flower and pearl: Stampin' Up! When we got our first indoor/outdoor cat New Years Eve 1997, I had expectations of sharing my home with a cuddly cat who would sit on my lap when I wanted her to and be outdoors each time I wanted to go out, too. Ha! Ha! I soon found out that it may say it MY house on the paperwork but when you invite a cat to live with you it soon becomes their house and you are just staff. We had always had outdoor only cats. Sure they came and went when they wanted to. That's what cats do. Now why did I think it would be any different with one that stay inside for several hours a day? After Casey passed away, we got our second indoor/outdoor, Jasper and learned another lesson. Every cat is different. Jasper is good about sleeping in the garage all night without scratching on the door until sunrise. 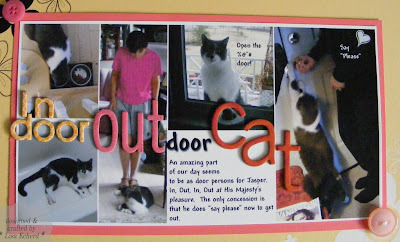 Our challenge with Jasper is his insistence on going in and outdoors all day long! It is particularly challenging on snow or rain days. He is convinced that if we open the door for him just one more time the weather will have cleared and it will be fun outside again. Doesn't matter if only 5 minutes have passed since the last time he came in. The other challenge that I have with him is he won't necessarily go "Out' for me when I tell him to. At least he doesn't run and hide under the furniture like Casey would do - especially if I was running late already. We put him out when we go somewhere, yet there he is in the 2nd photo from the left laying on the floor clearly ignoring my "Out" command. All Lenny has to do is say, "Jasper, Out" and he dutifully hops up and trots over to the door. It is sooo frustrating! The Blogging for Scrapbookers class (Shimelle.com) encouraged us to post and scrapbook about something routine from our day. Opening and closing doors for the cat is about as routine as it gets around here. 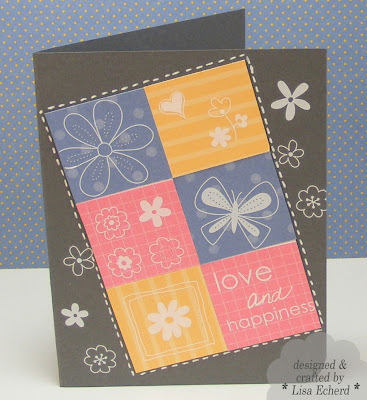 Rub-ons: Love and Happiness from Stampin' Up! 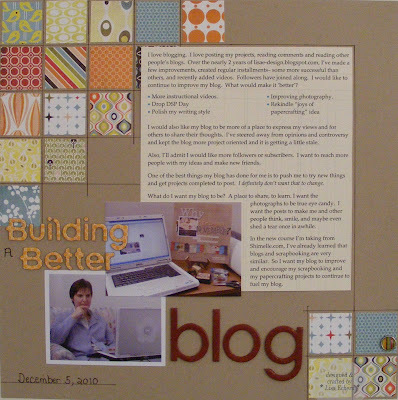 Lesson 3 of the Blogging for Scrapbookers class (shimelle.com) encourages us to write a post on 5 things we love right now. 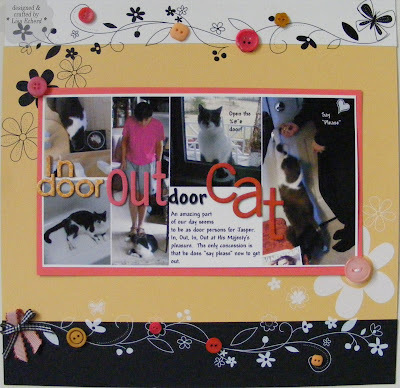 As with all the lessons, I can just post or do a post along with a scrapbook page. 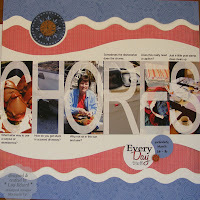 For this one I think I'll leave the scrapbook page of favorite things for later on. I've got a digi page in progress, a page on my worktable for a challenge and have another page dancing around in my head already. Song: Let Me Down Easy by Billy Currington. I loved this the first time I heard it on the radio just as I was pulling into my driveway. Available on i-Tunes. Favorite Store and recent purchase: Anthropologie. I love to walk through this store and imagine that I'm 20 years younger decorating my first apartment. Of course, in my fantasy I actually have money to do this. I recently bought this wonderful soap Mistral Soap in South Seas. It smells heavenly. To keep the name for fugure reference, I placed the wrapper in one of my desk cubbies and now I get this divine scent every time I open the lid on my antique desk. Heavenly. Software: Google Chrome. In doing the setup for this on-line class, I got so frustrated trying to make Google Reader work the way I was being instructed to do. Finally, I figured something was out of date. All the 'help' screens were referencing Google Chrome so I downloaded it expecting to get a new version of my Google toolbar. I got a whole new browser! Of course, I'd gotten messages in the past from the cyber world encouraging me to upgrade to Chrome because it was so much faster. And of course, I didn't have time to mess with them. Yes, there is something wrong with ignoring software that runs faster because you don't have time for it. Isn't this what I used to preach to the students of my computer classes who wanted to duck out early because they didn't have time to learn new techniques. Anyway, I LOVE, LOVE Google Chrome. It really is much faster than Internet Explorer. And the screen space is much more efficient. To give it a try, go here...Google Chrome Also on this page is a great little 'book' 20 Things I Learned which explains a lot of Internet terms and how things work. So that's my 5 things. What do they say about me? I spend a lot of time on my computer, I love Presidential history, I listen to Country Music, and occasionally buy myself a little sliver of youth with a trip to a fun store. 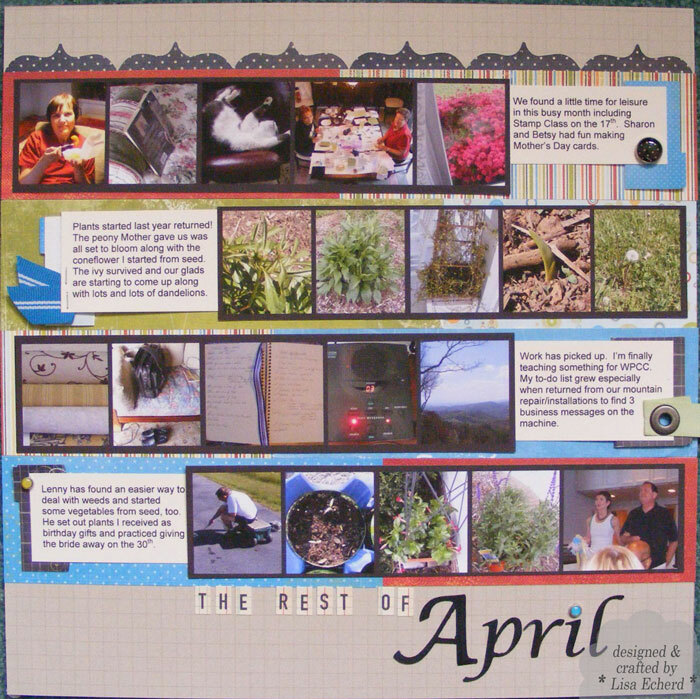 And speaking of time on my computer, didn't I say I had a layout awaiting me on my worktable? 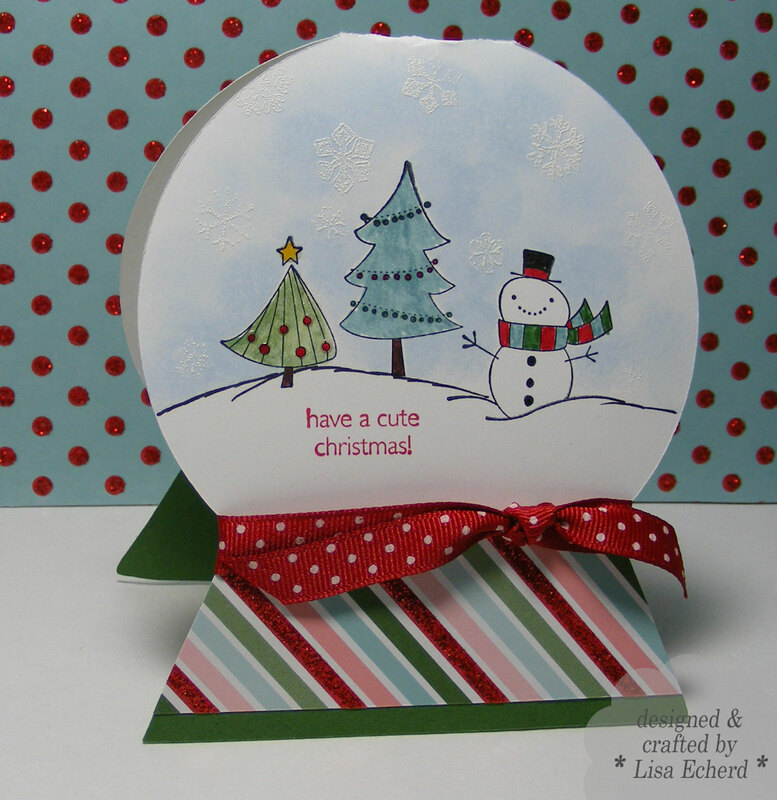 A set of note cards is an always appreciated hostess or holiday gift. Personalizing them with initials makes the cards extra special. Since I was using a dark cardstock, I lined the inside of the cards with a light designer paper - one of those thin papers from a paper pad. 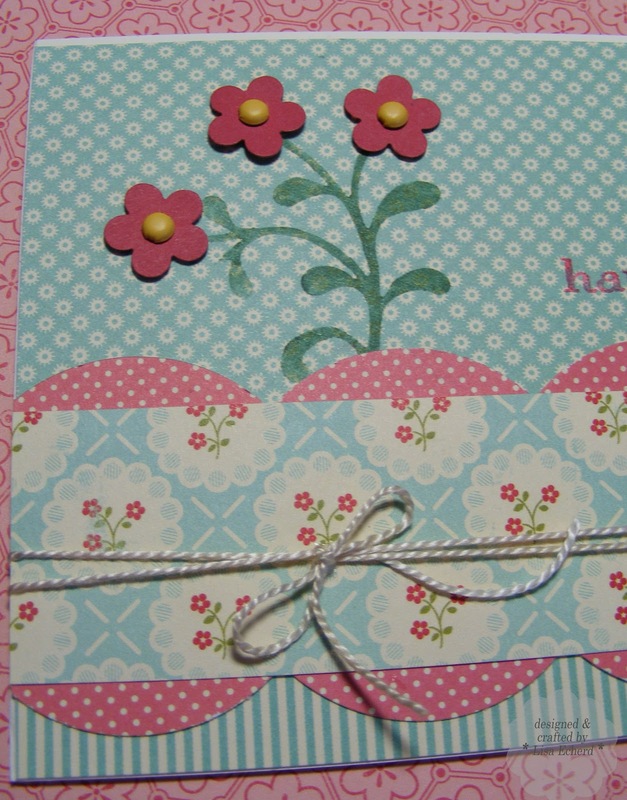 I also lined the envelopes from the same type of paper in a small polka dot pattern. A little designer paper went a long way used in strips on the card. The initials are also stamped on DSP using the Stamp-a-ma-jig to guide placement. 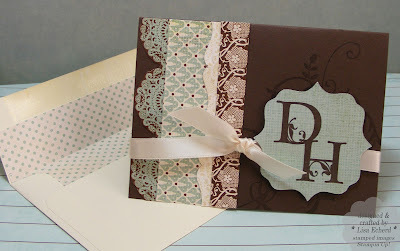 Ingredients: Stamps: Baroque Motifs, Lovely Letters by Stampin' Up! Cardstock: Early Espresso by SU! 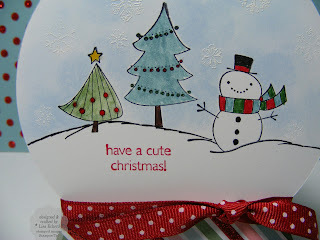 Let's wrap up the Cute Christmas stamp set. The card above is based on one from the back of last year's Stampin' Up! mini catalog. 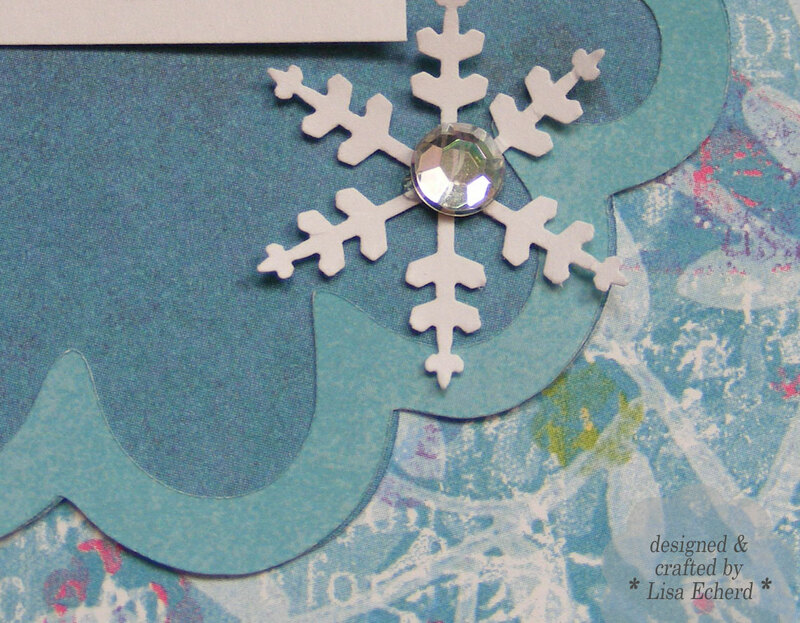 That card had cut out snow men from a different stamp set. I did a lot of masking instead to take off one tree from a 3 tree stamp and add the snowman. Then I masked the trees and the snowman to do the background. Why are they always snow "men" and not snow "women"? Just a random thought that popped into my head. Oh well! Just about done getting my cards in the mail. The post office was being picky yesterday on postage wanting that extra 20 cents on anything with a 'bump' which is most anything I make! 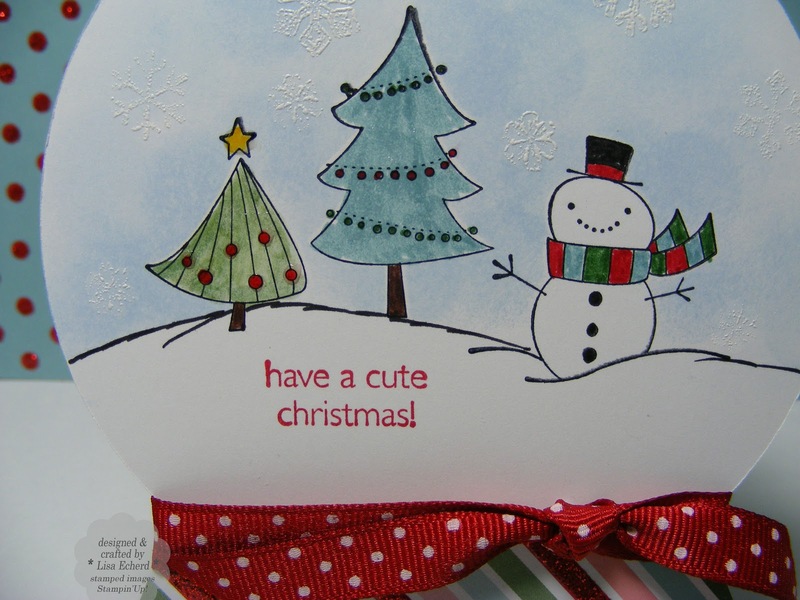 The greeting on this last card is from the Christmas Punch set and it always gets that 'holly jolly' song in my head. Oh, here it goes again... Hope you have a Holly Jolly Friday! Ingredients: Stamps: Cute Christmas and Christmas Punch from Stampin' Up! Ribbon: Fabric store for white and Paper Studio for red polka dot. Most of November seemed like one problem after another. Many of them minor or at least things we know will resolve themselves. Others were important on-going issues that seemed to grow more challenging. Some things were nuisances that just needed to be taken care of. I started dreading hearing the phone ring - what now??? Because I was sick for over a week, I didn't bother with taking very many pictures for Project 365. Who wants to capture all this trouble? Despite a lack of photos, I still thought it was important to capture this month of our lives. It won't always be November, 2010. In fact, December has already been turning the tide in many cases. When we look back on this page someday, it may be a month where everything is going great and we can remember how blessed we are. Or it may be a worse month and we would give anything to hear my parents on the other end of the phone. 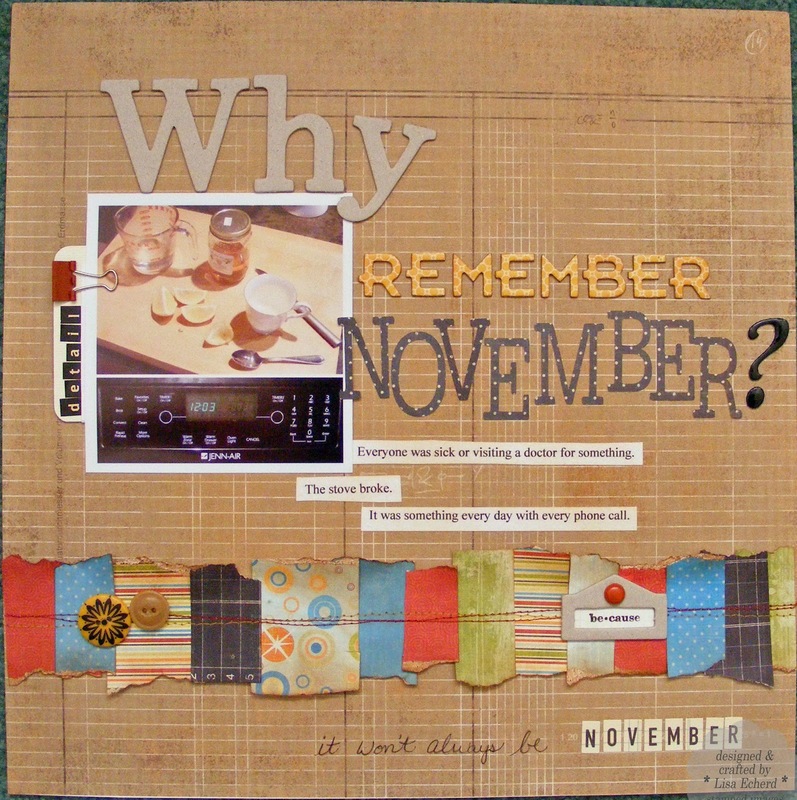 One thing is certain, it won't be this particular month again, and that is one of the many reasons why we scrapbook. 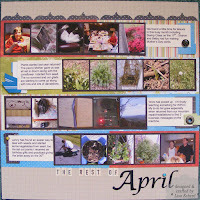 This page is for the Two Peas Challenge to capture a month. I also used some suggestions from the Blogging for Scrapbookers class at shimelle.com. The class reminds us that we may not want to reveal everything in our blog posts - protect privacy and add a little mystery. I didn't go into details in either the page or the post about specific illnesses or personal business. 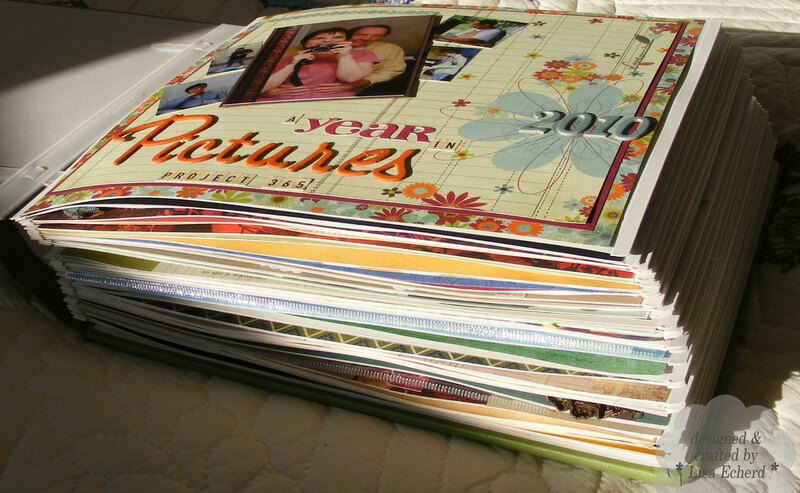 With both blogs and scrapbooks we have to respect the privacy of others in our lives. 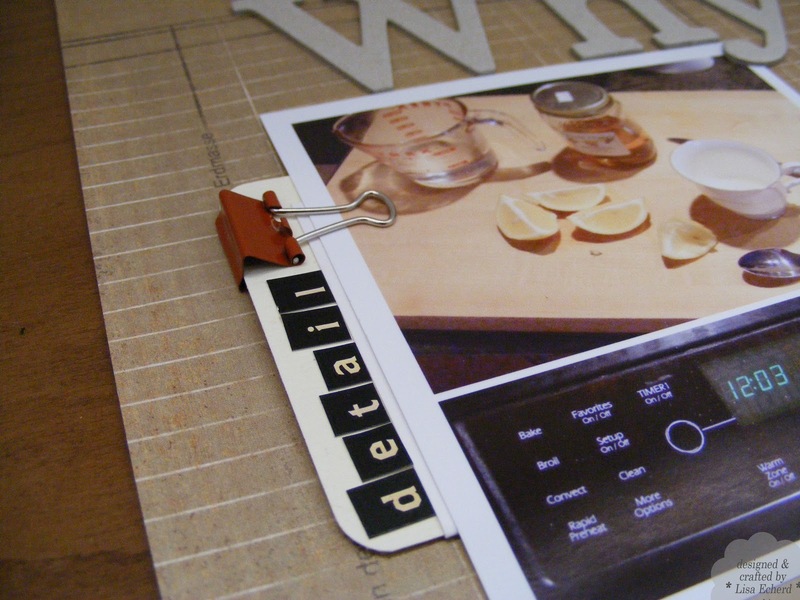 The journaling is hidden in a pullout behind the photos of 'honey lemon' as my husband calls our 'miracle' cold cure and a photo of our stove resurrected from the dead. 16 days without a stove or oven is interminable! A heavy coat of Vintage Photo distress ink toned down the bright colors in these Fancy Pants paper strips for the border. 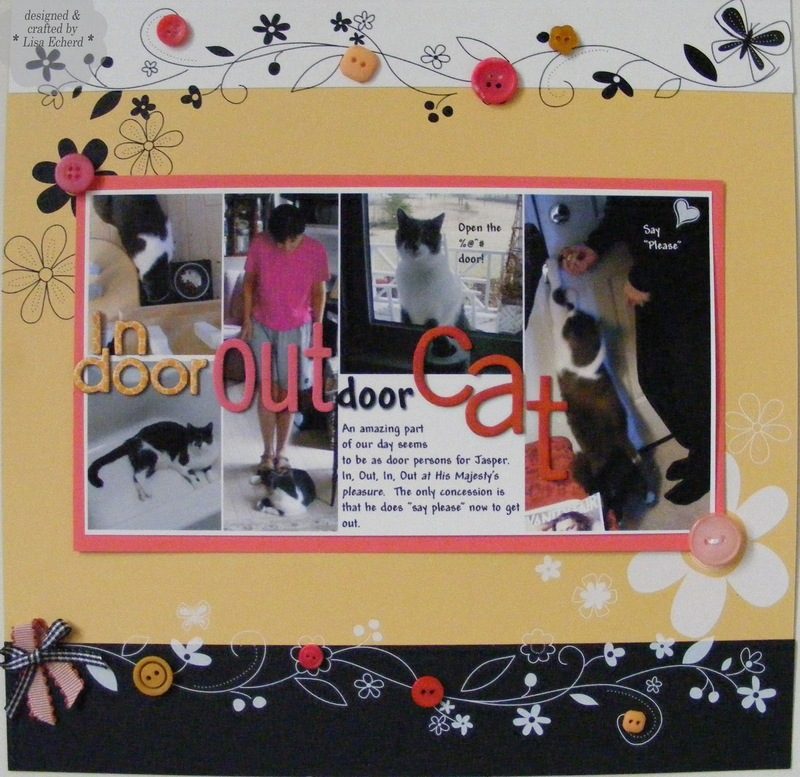 All the chipboard is left bare so this was a quick page. There will be one more November page in our book. We had a very nice Thanksgiving and I'll do a page on that soon. Thanks for visiting! 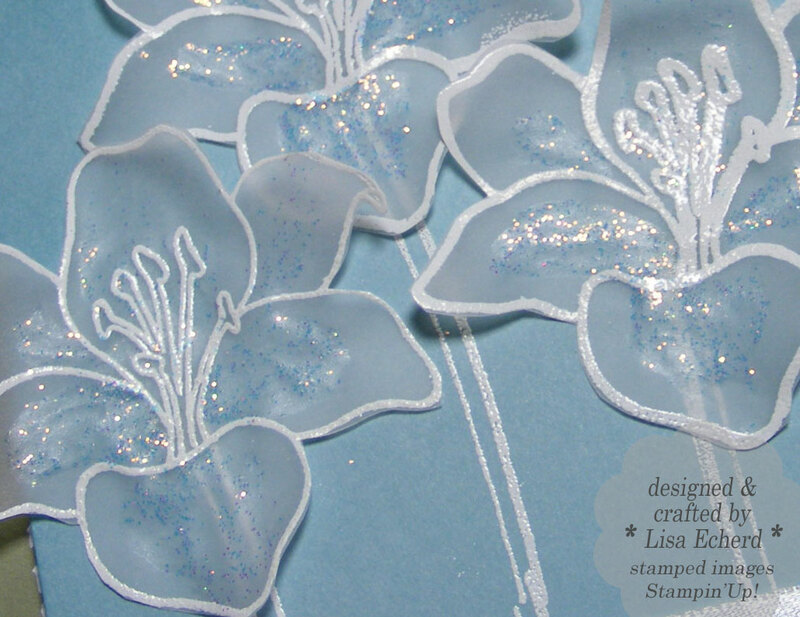 Stamps: Define Your Life by Stampin' Up! I love blogging! Having a blog has helped me be more creative - not just in trying new things but also in getting stuff done! 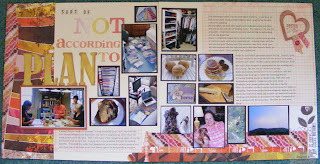 The regular features of the blog and the various challenges have really built up a stash of cards - many have gone to Operation Write Home - and a couple of very full scrapbook albums. Recently, a Christmas class from shimelle.com was promoted over at Two Peas. 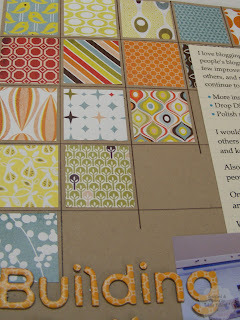 As tempting as that class sounded, I found myself being drawn to another class at her site - Blogging for Scrapbookers. I knew I wanted to do more with my blog and this seemed like the perfect opportunity. The class was run last year, but you can take one any time. Since I'm doing this on my own, I'm going to do the lessons (prompts) at my own pace probably 2 or 3 per week. That way I'll have time to do the scrapbooking pages that go along with the lessons. 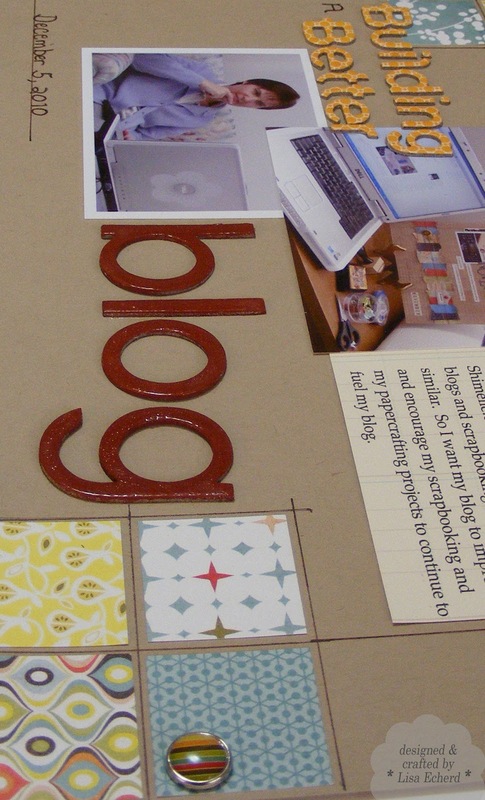 This first lesson was to think about what I want to do with my blog. I love blogging. I love posting my projects, reading comments and reading other people’s blogs. Over the nearly 2 years of lisae-design.blogspot.com, I’ve made a few improvements, created regular installments– some more successful than others, and recently added videos. Followers have joined along. I would like to continue to improve my blog. What would make it ‘better’? I would also like my blog to be more of a place to express my views and for others to share their thoughts. I’ve steered away from opinions and controversy and kept the blog more project oriented and it is getting a little stale. Also, I’ll admit I would like more followers or subscribers. I want to reach more people with my ideas and make new friends. One of the best things my blog has done for me is to push me to try new things and get projects completed to post. I definitely don’t want that to change. What do I want my blog to be? A place to share, to learn. I want the photographs to be true eye candy. I want the posts to make me and other people think, smile, and maybe even shed a tear once in awhile. In the new course I’m taking from Shimelle.com, I’ve already learned that blogs and scrapbooking are very similar. 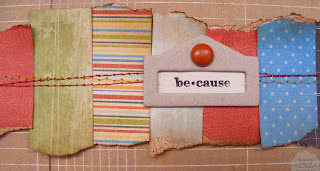 So I want my blog to improve and encourage my scrapbooking and my papercrafting projects to continue to fuel my blog. 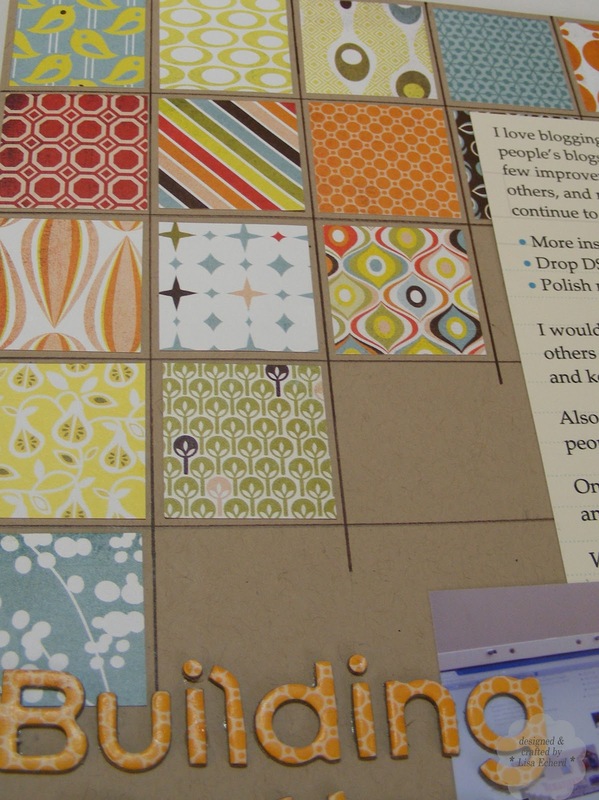 For the page I 'built' a grid of modern designer papers from the Offbeat paper pad by Basic Grey. The squares are cut 1 1/4" on a 1 3/8" grid. Basic Grey's Magnetic Mat and ruler makes this go smoothly. I used a Zig marker because of the fine tip for drawing my chocolate brown lines. 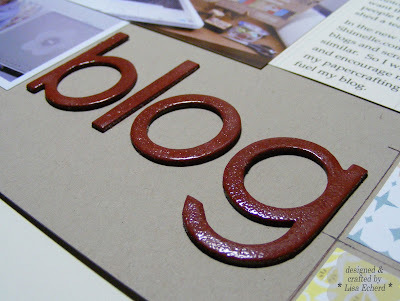 Yesterday's TIPsy Tuesday post talks about the BLOG chipboard letters and getting that great glazed look. As I said in the journaling, I want my readers to learn something and find a visit here worthwhile. What would make the blog better? Suggestions and comments greatly appreciated and helpful! Thanks! 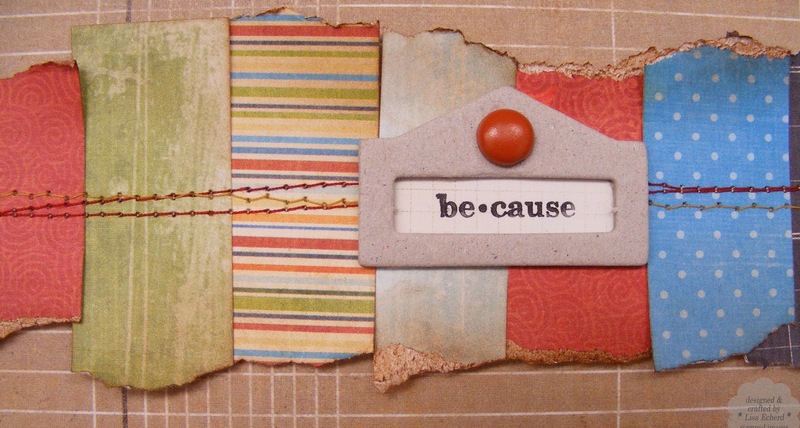 I love undressed or raw chipboard because it is sooo very versatile. Typically, I paint it. Sometimes I stamp it or even leave it undressed. 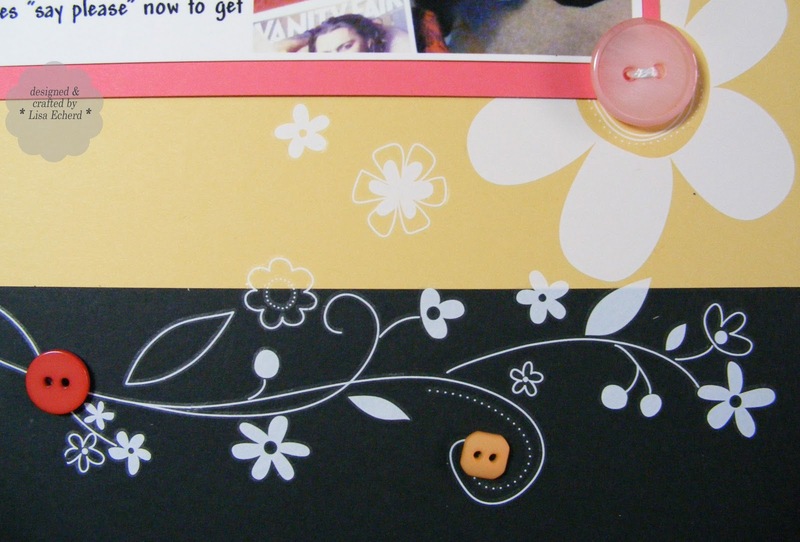 When I paint my chipboard, I may add some distressing via ink or more paint. 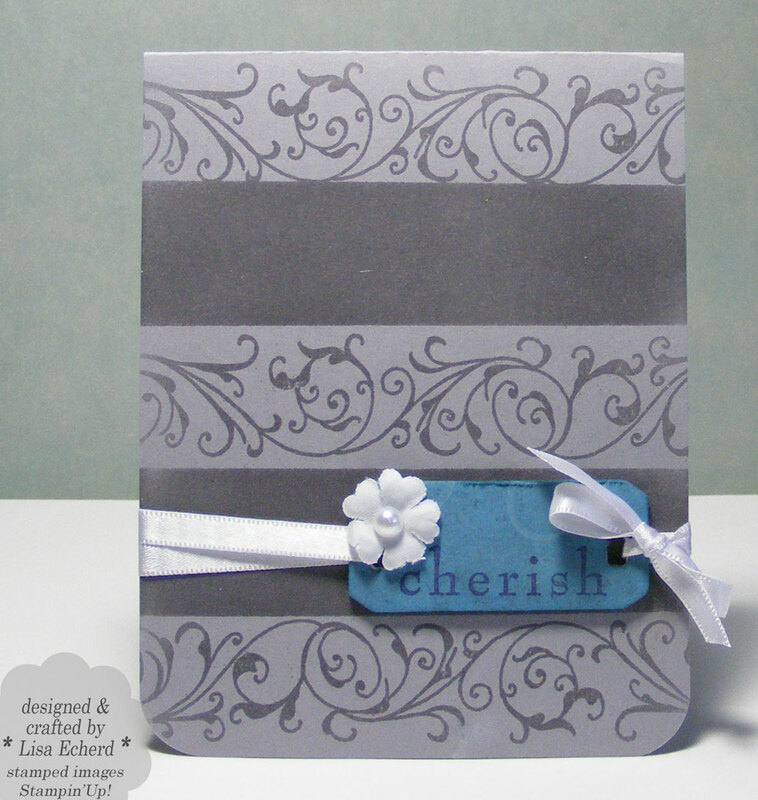 Another great finish is to give it a glossy look with embossing powder. Paint the chipboard with acrylic paint. One coat will usually do it. 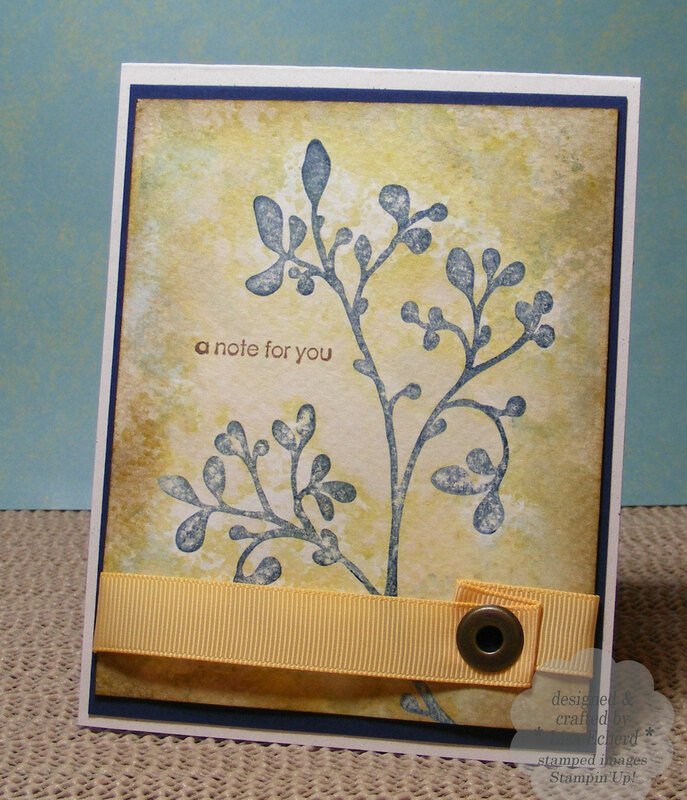 You can also color with ink - pigment inks like Stampin' Up! Craft work best. After it is completely dry, press each letter into a Versamark pad. Coat with clear embossing powder heat. You'll get a nice glossy finish to the letters. I keep an older Versamark pad for this purpose in case a little paint rubs off. Another option for gloss is either Glossy Accents by Ranger or Stampin' Up! 's Crystal Effects. 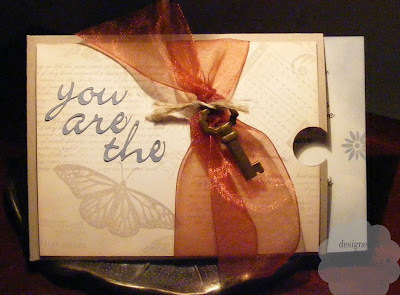 I prefer the embossing because your letters are dry and ready to use. No waiting. Clear embossing powder by Stampin' Up!